The characteristic of the Walser settlements is not only found in villages but also on the alps. The lonely regions that are only used over summer have the same scattered characteristics as the villages. Above the forest line situated in basins and dips., especially in Montafon and Großwalsertal, there are sunburnt wooden houses, alpine dairies and barns close next to each other. They seem randomly mixed like a “Haufendorf”. The alpine dairy building represents the middle of such an alp-village. The economic system of single dairies was abandoned for the largest part as well as making hay did on the alps. Instead, pasture farming and villages develop. 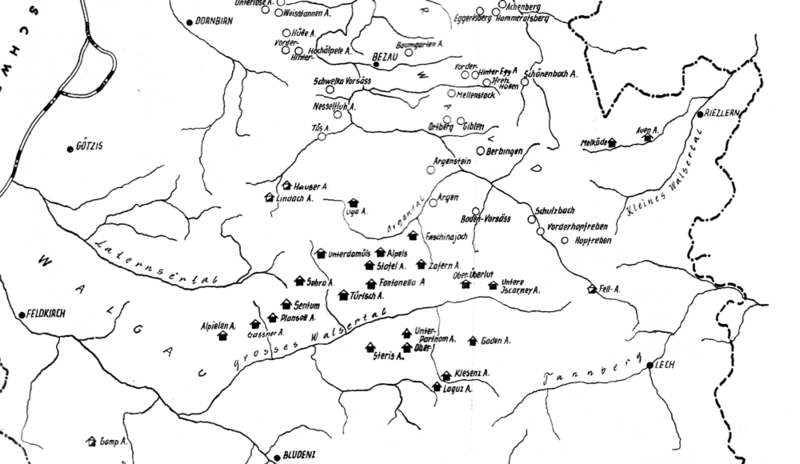 These alp-villages only emerged in the Walser settlement areas. In other parts of Vorarlberg there are collective municipalities or cooperatives to whom the Walser’s individual way of working is alien. Use this portlet to restrict the articles to the regions they were assigned to. Regions that do not have any articles assigned are grayed out. Selecting all or no regions makes all articles appear in the result set. How did the Walser settle?